‘Songs of My Soul: Lyrical Weavings of Contemporary Textile Art’ brings together the locally-inspired textile art and natural dyeing skills of Thai master weaverKachama Perez whose creative approach to blending modern ideas with traditional weaving techniques hasearned her work international recognition through a series of exhibitions held in Thailand, Japan and France over the past decade. 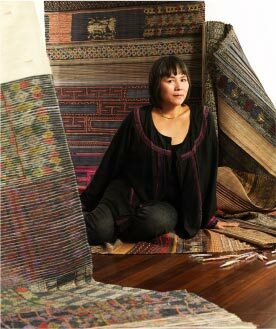 Kachama Perez was born in Bangkok to a mother who sewed many of her own clothes and passed on to her daughter a deep and lasting love for the beauty and richness of handcrafted textiles. Once she was old enough, Kachama accompanied her father, who was a doctor, on his professional travels through many of the provinces of northern and northeastern Thailand. By meeting and talking with local villagers, she becameacquainted with the distinctive weaving traditions of each region. She went on to study at Tokyo Mode College and spent an additional threeyears working in Japan. After returning to Thailand, she settled in Chiang Mai, where she lives with her husband Jean and their children. ‘Songs of My Soul: Lyrical Weavings of Contemporary Textile Art’reflects the Northern Thai customs and traditions of hill tribe communities.The exhibitionis set against the backdrop of the Lanna-inspired architecture of Tamarind Village Chiang Mai on the second floor of Ruen Tamarind, captures Kachama’s varied interests and passions by picking up the themes which are closest to herheart: the preservation of hill tribe culture, the need to protect our fragile natural environment and thecelebration of her craft in all of its intricacies and forms. Sakul's portfolio has included many important projects including royal commissions for H.M. Queen Sirikit and a property-wide conceptual design for Bulgari Hotels & Resorts, Bali. Author of numerous books and a regular magazine columnist writing on topics related to floral arts, Sakul also lends his talents to product design. The textiles on display in the exhibition dedicated to the theme ‘Keeping Lanna Heritage and Hill Tribe Culture Alive’ for example, bear witness to the weaving techniques of various tribal people, incorporating the bead work of the Katu and the Karen into certain pieces and small strips of silver braids and indigo-dyed fabric fragments of the Hmong into others, in a celebration of the skills that were passed down from generation to generation over the centuries. 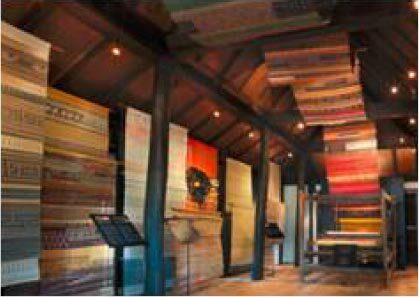 And the works on display under the theme 'From Earth to Heaven' in which Kachama has woven rice grains, straw and rice husks into a number of textiles to highlight the close ties between rice planting and weaving in the life of Thai people in the past. Both exquisite works were inspired from the artist’s rich life experience, spent living with various peaceful rural hill tribe communities in the north of Thailand. Some of the artist's most work evolved out of her deeply-rooted appreciation for nature and her unique vision on environmental conservation. In a desire to share her feelings with her audience, Kachama decided to incorporate worn out bits of metal and shreds of discarded plastic bags collected on her trips to the forest into her weaving, in order to highlight the need to recycle and care for our fragile world. The results are a number of bold and visually striking works grouped around the themes 'Trash and Recycling','Tears of the Sea’ and the theme 'Tales of Silk' focus on the precise art of silk thread production and the advanced technique required to create mud mee 'tie-dye' cloth.